Several projects underway to hopefully complete this month! For the CQJP 2015 quilt, I had a small piece of green fabric that I just loved as the background. But it wasn't enough. I looked at nearly every quilt shop in the Denver/northern Colorado area in an attempt to find more or something different that would work as well. NO such luck. I had purchased the piece from a vendor at the annual Denver Quilt and Sewing show, so on Friday morning, I was first in line to get through the door and made a beeline for my favorite vendor that always had a wonderful selection of batik fabrics and was probably where I purchased the original piece. As luck (or God's blessing!) would have it, they had a single yard of the fabric left and two 1/2 yard pieces. I bought them all! Sadly the vendor is retiring and this was their last show. I will miss their selection of fabrics, but how grateful I am to have found exactly the fabric I wanted to finish this quilt! I'm also working on my Mollie Feathers project and hope to have it completed this month as well. Then there is a smaller piece... but more about that will have to wait for a much later date! It too needs to be completed before the month is over! Lots to work on! Must say that it is very inspiring to have these three projects to work on this month! Kitzy Cat has had a spring project as well. She has a terribly thick coat of fur with an even thicker undercoat. She sheds huge amounts of fur all year long, in big ugly clumps that I clean from the furniture and floor daily. So much fur also causes her to produce numerous hairballs ~ several a day. The fur gets so long and thick that it makes it hard for her to move sometimes. 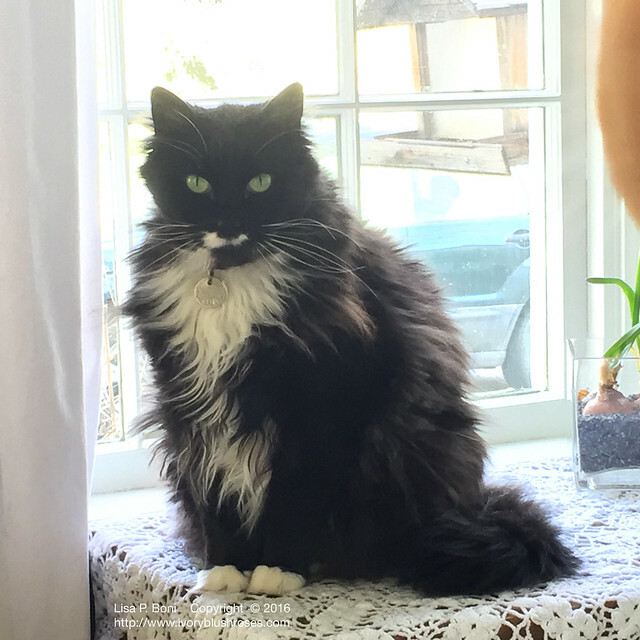 Though she looks pretty magnificent, she tends to be timid, sullen, not very friendly and has a hard time keeping her food down when her coat looks like this. My daughter-in-law Becca is a Vet Tech for a cat hospital and she gave Kitzy a "lion" haircut this past week! I know that some people would consider doing one of these lion cuts on a cat to be akin to abuse, but if they could the transformation that it induces in Kitzy, they would change their mind! 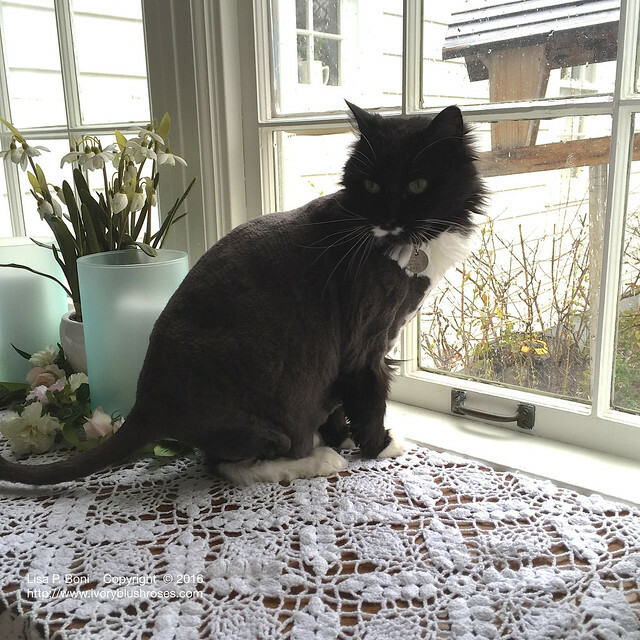 She is friskier, happier, friendlier, doesn't cough up hairballs multiple times a day, keeps her food down and is the spunkiest, proudest cat you can imagine after her haircut! Though she looks a little goofy, she's so much happier! Such a dramatic, positive change from her usual sullen, timid self! The week before Easter, I was to go on a birding trip to Nebraska to see the Sandhill Cranes. 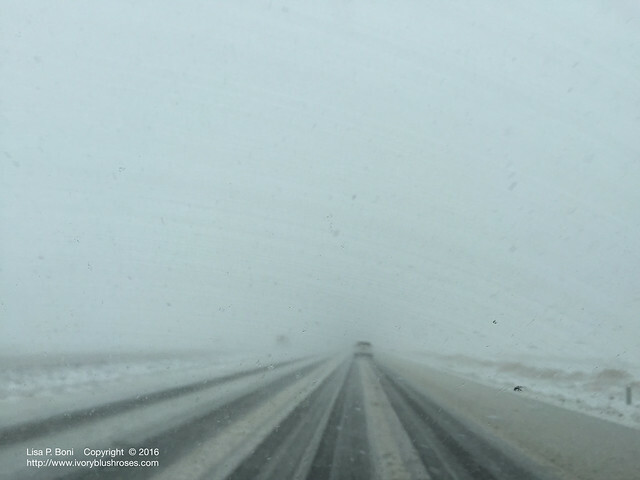 The trip was cancelled because of a spring blizzard! I had to drive home from work in it. 55 miles of stop and go and poor visibility. What looks like snow on the windshield is actually blowing snow. Truly horizontal. The roads were icy and miserable, but it was the wind I was most concerned about. With the ice on the road, I thought it was more likely to be blown off the road rather than to simply slide off due to the ice. Made it home (very slowly!) safe and sound and was quite happy to miss the birding trip! Though the two people of our group who managed to make it there did get to see a rare whooping crane! In all, Greeley got off easy with about 6-8" of snow, but the Denver area got hammered with nearly 2 feet of snow! Easter was lovely! The snow melted and while it was chilly out, it was a nice sunny day! It was made even better by having most of my kids spend the afternoon and evening at my house! We had such a good time that none of us ever thought to stop and photos of us altogether! The only photos I took this year were of the table while I was getting things ready. The table was very simple this year. Later it was filled with our traditional Easter dinner of Ginger Chicken, asparagus, Mandarin salad, lemon jello salad, deviled eggs, hot cross buns, an assortment of homemade pickles, and long grain and wild rice. Dessert was a yummy lemon pound cake with lemon glaze and fresh strawberries! All homemade from scratch and all very yummy! We've been making the same menu for over 30 years! Tulips and daffodils in a green teapot with the new little bunnies that my sister sent me made for a sweet centerpiece! 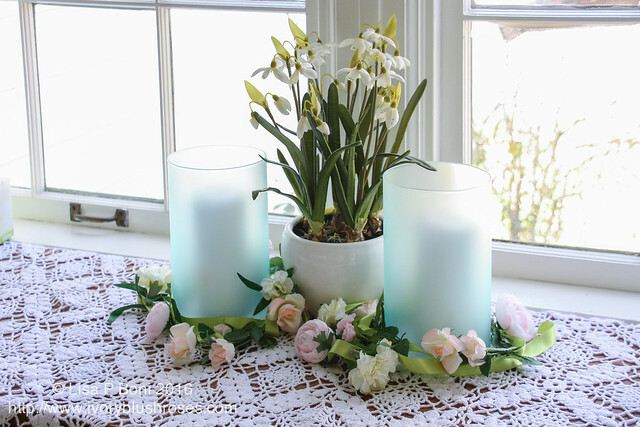 On the sideboard, a pot of silk snowdrops that used to belong to my mother and the ribbon flower garland that I made several years ago dressed up the two hurricane candle holders. It was nice to keep things simple this year. Just a few touches that can happily stay out for the remainder of spring! to the guiding light of the eternal. May the wandering find places of welcome. May your cross this day be shielding them. The arms of God to welcome us and bring us home. We trim our cats fur for the same reasons you mentioned. She is so much more comfortable without the thick coat! So happy that you are working on your beautiful CQ projects Lisa. Doubly happy the Kitzy Cat has got a trim so she is more comfortable. bridge." Maybe the Vet would know what it's called. 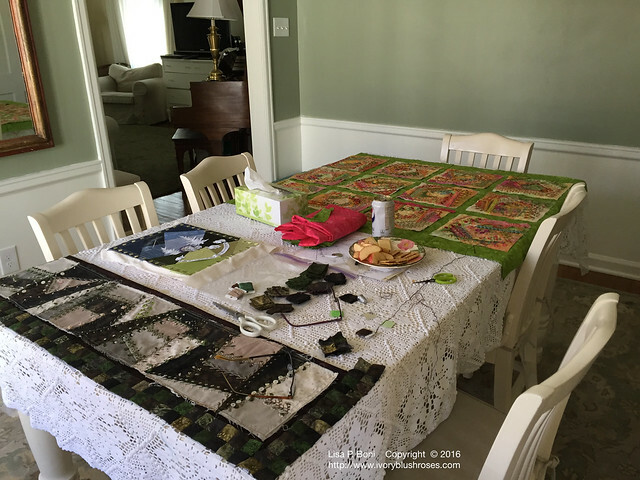 So glad you found more of that green fabric to finish your quilting project. I love the black crazy quilt piece you are working on. I looked at a larger picture of it and it is oh so lovely. It speaks to me for some reason. 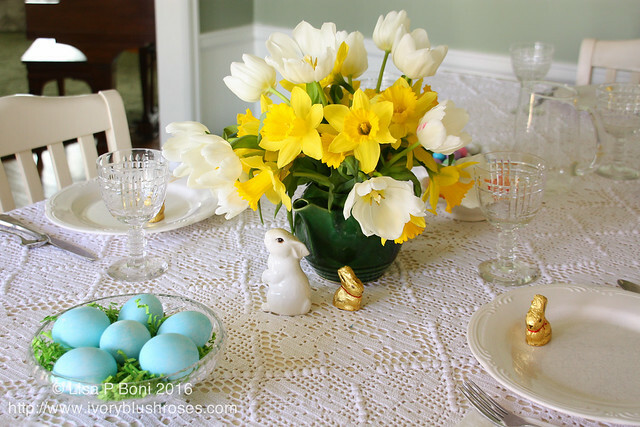 Your Easter table looked lovely and it was nice you had such a great time with family and good food. Lisa, your CQ projects are gorgeous! I am so glad you found the fabric you wanted. :) It never would have occurred to me that a cat could feel so much better with a hair cut! I am so glad it helped. Hi Lisa! 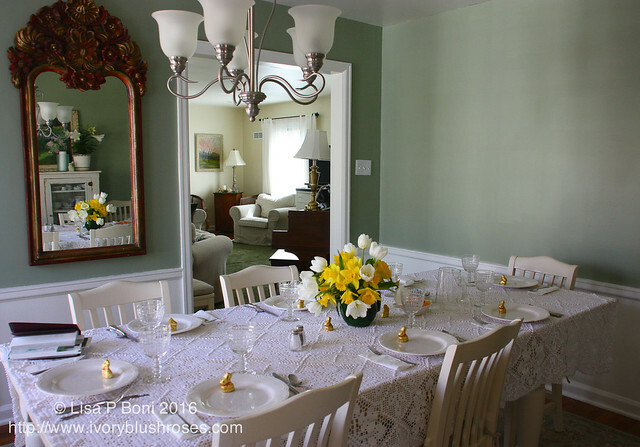 Your table is so lovely and your Easter dinner sounds WONDERFUL!!! Happy Easter!